Stepping in to take care of an aging parent or loved one can be done out of a sense of obligation or to repay a loved one for the ways they’ve affected your life. Whichever motivates your role reversal, don’t make the decision without knowing the facts: becoming a full-time caregiver for your loved one can jeopardize your future financial security. President of the Women’s Institute for a Secure Retirement (WISER) says, “Women who become caregivers for an elderly parent or friend are more than twice as likely to end up living in poverty than if they aren’t caregivers.” Discover the expected and unexpected costs that come along with personally providing home health care for your loved one. Family caregivers often feel the need to reduce the quantity of hours they work at their day job or retire early, resulting in an average loss of $143,000 according to a MetLife study. That number is a result of the lower wages, lost income and missed potential promotions that come from becoming an unpaid caregiver. Leaving the workforce can also have an effect on your social security benefits, cause you to lose your health insurance or reduce your opportunities to contribute to a 401(k) plan. While working to stabilize or improve the health of your loved ones, you may see yours declining. The mental, physical and emotional labor of caring for a loved one is taxing on the mind, body and soul. The Center on Aging found that more than 1 in 10 caregivers say that their role as a caregiver for a loved one has caused their own health to decline and Family Caregiver Alliance warns that the risk for premature death is 63% higher if they are experiencing “caregiver strain.” The Alliance also cautions that heart disease, cancer, diabetes, arthritis and other chronic conditions can occur at nearly twice the rate compared to non-caregivers. Financially, this can mean increased healthcare costs for you and your family. Miscellaneous costs that come up on the spot can add up. You may likely foot the bill for “little” charges like transportation, groceries or necessities that are running low. However, such nominal expenses can cost an average of $12,000 a year, according to MetLife research. A stunning 47% of working caregivers reported having used up all or most of their savings on such expenditures, according to the National Alliance for Caregiving and Evercare. Providing personal care for a loved one can be equal to a year of college tuition in cost, average out to a part-time job in hours and put the caregiver at the highest risk for experiencing full-blown depression and anxiety. But there are better options. Split the responsibilities with a trained professional such as the Certified Nursing Assistants and Home Health Aides at Granny NANNIES for in-home care. Home health aides and Certified Nursing Assistants are able to provide your loved one with professional care at home and allow you to keep any guilt at bay. 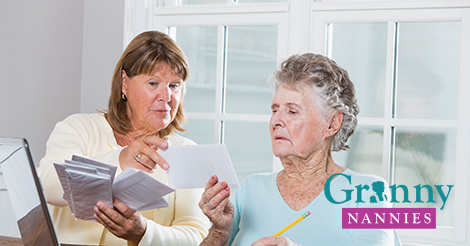 With nursing home costs on the rise, choose in-home care with the nation’s experts – Granny NANNIES. Founded with the same desire to keep an aging parent at home, Granny NANNIES has been providing specialized private duty home care services for the elderly since 1990. Granny NANNIES provides home health care services to individuals of any age or diagnosis. Services include respite care relief, fall prevention care and stroke recovery care, among others, and can be personalized to meet any home care requirements. Located in 35 cities across 10 states, the Home Health Aides and Certified Nursing Assistants at Granny NANNIES are available 24 hours a day, 7 days a week. You and your loved one will be treated with the highest level of respect and dignity by CNAs and HHAs that have been through credential, national criminal background and reference checks and display the kindness and compassion needed to care for others. For quality, trustworthy, reliable and affordable senior care, call 800-316-2669.